Tipping point: Is it advisable to invest in technology sector funds? Software industry body the National Association of Software and Services Companies (Nasscom) on Wednesday said they would not provide growth projections for the industry anymore. Increasing uncertainty in the sector and its changing nature were some of the reasons for this decision, it said. From 2019-20 (FY20), it will only give guidance for the sector. For FY20, it said the outlook for the industry would be “cautiously optimistic”. “It is impossible to predict what will happen with a lot of political rhetoric,” said Debjani Ghosh, president, Nasscom. Some of the key concerns the industry body highlighted were protectionist policies (particularly in the US, impacting H1B visas), trade wars as well as talent crunch slowing business. According to Nasscom’s strategic review for 2018-19 (FY19), its export growth projection was 9.2 per cent, slightly higher than its industry growth projection of 7-9 per cent. In 2017, Nasscom had deferred guidance by a quarter due to uncertainties. The IT exports in FY19 crossed $137 billion in revenues, higher than Nasscom’s earlier estimate though the domestic market grew at a slightly moderate rate of 7.9 per cent. The different segments of the industry have also expanded beyond IT services, and provided more than half the revenue in FY19. For instance, digital was the driver of growth in the year. On a year-on-year basis, it grew 30 per cent to touch $33 billion. To enhance digital capabilities, the industry was investing in setting up centres of excellence and innovation hubs in key markets. Growth in the start-up sector was another key highlight, with eight new unicorns being born. Funding for start-ups also reached an all-time high. 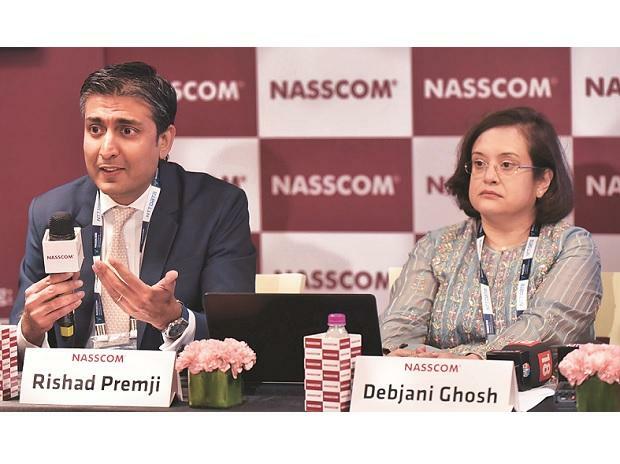 This year, Nasscom also conducted its first Chief Executive Officer (CEO) Survey to find out what industry captains were thinking of opportunities and risks. According to the survey most CEOs were cautious due to the global economic uncertainties. They also expect digitisation initiatives to continue at the same momentum. Digitisation of businesses and enhanced customer experience emerged as the two top spending areas in the IT-BPM space for 2019, according to the survey. “The guidance we used to provide earlier was by looking at the past. We believe that is not the right thing to do for this industry is looking at the future. We have to create a new lens when we are looking at the future and understand the sentiment from the CEOs,” said Ghosh. In 2018, 170,000 new jobs were generated by the industry and 600,000 people were reskilled in digital technology. However, the industry still continues to face a massive shortage of talent for which, Nasscom said, it was working with the government to enable better skilling initiatives. Atul Nishar, founder and chairman of mid-sized IT services firm Hexaware, said given that the industry surpassed Nasscom’s 2018 revenue guidance, the lack of guidance this year should not be a major concern. “Last year, around this time, the industry was quite pessimistic about their outlook and yet growth that followed was phenomenal. Frankly, the challenges haven’t changed this year. So barring unforeseen circumstances, there is no reason why the same performance cannot get repeated,” said Nishar.